Business processes, hierarchies and goals can be difficult to effectively communicate. While many applications on the market can help you in the design process, the cost of entry for these can far outweigh the need. For example, you might have a medium to large business hierarchy diagram that is constantly changing. With employees constantly coming and going, you need an easy way be sure that the information in the graphic is kept up to date. If this is a need that your business has, Microsoft Word, the most popular word processing program, has many features that can help you get started. There is a graphic feature called SmartArt that can help you create simple, flexible diagrams. Going beyond Microsoft Word, SmartArt is also available in several of the other Microsoft Office programs including Excel, Visio and PowerPoint. SmartArt includes a graphic solution for lists, processes, cycles, hierarchies, relationships and more. After you decide the appropriate format, SmartArt includes two contextual tabs that allow you to control the design and format of the graphic. The items in the graphic are controlled through the Text Pane and work similar to a bullet list, where you can create top-level items and then sub-items as needed. The individual shapes of a SmartArt graphic can be designed independently, or you can control the overall design to maintain a consistent look. In addition, when you change a font size of one SmartArt object, all related items will change their size proportionally. One of the best ways I have implemented SmartArt at the Digital Workshop Center is to create a simple infographic to help explain our certification programs. An infographic is a graphical way to describe our services, combining text and graphic elements to convey the information in a unique way. SmartArt allows me to create a simple infographic within an existing Office document and avoid the time involved with using a graphics program such as Adobe Photoshop. 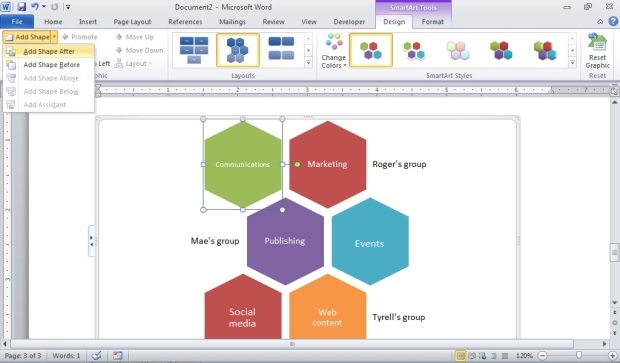 SmartArt is one of the many tools that are underutilized in the Microsoft Office suite. One of the comments about SmartArt I regularly hear in our classes is “I had no idea that existed in Microsoft Office!” I encourage you to try inserting it into your next Office document and start creating a SmartArt diagram for yourself.